Learn more or register today. • Incorporate the principles of the Framework for 21st Century School Nursing PracticeTM into daily practice to advance student and population health. • Identify school nursing trends that have evolved over the last 50 years of NASN and apply evidence-based best practices that promote student health, academic success and healthy school communities. • Integrate leadership concepts through professional growth, development and responsibilities to optimize the role of the school nurse. • Identify partnerships and collaborations that will assist with advocacy efforts to enhance and empower the school nurse role in student health and wellness. Deadline has passed. The 2020 Call for Abstracts will open in August 2019. The NASN Annual Conference offers those companies with school health related products and services the widest possible exposure to school nurses. NASN members and conference attendees are pivotal links to students, parents, teachers, staff, and the larger community beyond the educational setting. Exhibiting offers you the opportunity to meet face-to-face with this qualified audience. 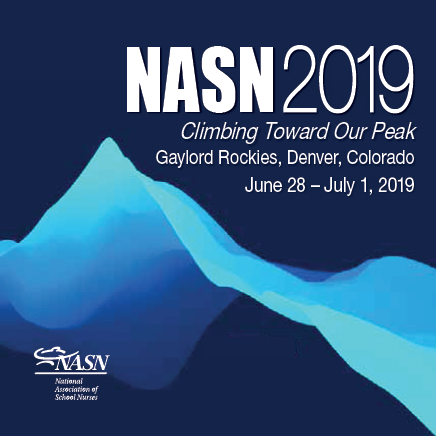 Visit NASN2019 for information about this year's exhibiting and sponsorship opportunities.